SOLD OUT! BIGGEST CROWD IN CASINO'S HISTORY! Feb 14th, 15th - Clearwater River Casino, Lewiston, ID. Over 2000 people in attendance, Friday and Saturday. SOLD OUT both nights! 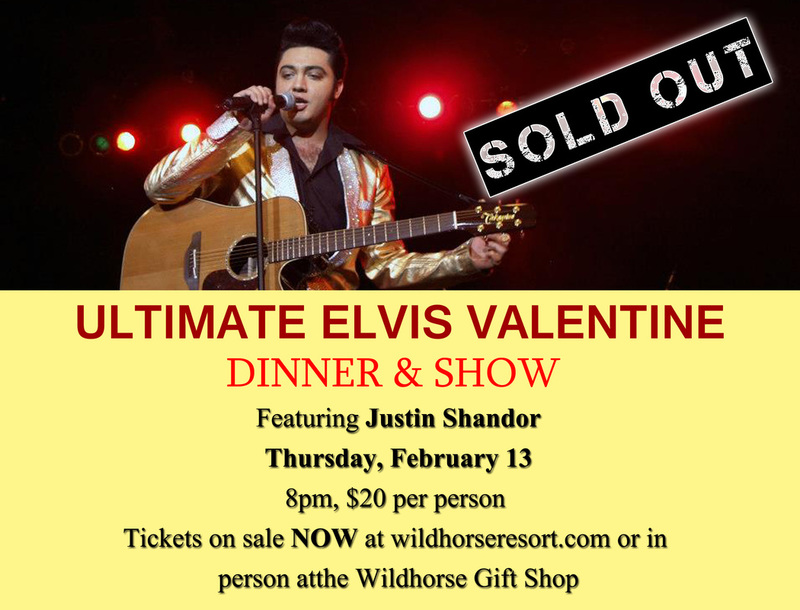 Feb 13th - Wildhorse Resort and Casino, OR. Valentine's bash, turned 500 people away! Jan. 23rd,Tachi Palace in Lemoore, CA SOLD OUT! Over 1,500 tickets at $20, $30 nd $50 a piece. Call Rochelle Delong at 559-925-7655. Jan. 8th 2014 - 1,900 in attendance at $20 each. Isleta Casino Albuquerque New Mexico. Call Sean 1-505-724-3964. Dec 7th 2013 - The Point Casino, OR. SOLD OUT! Over 500 in attendance, two years in a row! Oct 5th 2013 - ELK'S VALLEY CASINO, California. Show was SOLD OUT! People were turned away! August 23rd and 24th 2013 - SKAGIT VALLEY CASINO, Washington. Both shows SOLD OUT! Aug 10th 2013 - Inn of the Mountain Gods in, NM SOLD OUT show three weeks before concert, tickets went from $35-100 for tickets. Over 700 in attendance. Show SOLD OUT 3 years in a row! July 27th 2013 CAVEMAN PLAZA Back to the 50's Festival, Downtown Center Grant's Pass, Oregon. Over 20,000 people in attendance. 6 years in a row! Jan 18th & 19th 2013 - JACKPOT JUNCTION CASINO Morton, MN. Over 4,000 in attendance. Jan 8th 2013 - HARD ROCK HOTEL & CASINO, Albuquerque, NM. 2,600 people SOLD OUT! Aug 31st 2012 - MOVISTAR ARENA, Santiago, Chile, 15,000 people, SOLD OUT! July 26th-29th 2012 - COLLINGWOOD ELVIS FESTIVAL Alberta, Canada. 25,000 people. June 29th & 30th 2012 - CHINOOK WINDS CASINO Lincoln City, OR. Over 1,200 people and they had to turn away 600! SOLD OUT! "Jamie, I talked to you at Justin's Albuquerque, NM show at the Hardrock Casino but wanted to repeat what I said! I saw Elvis at the Hilton in Vegas in 1973 or 74 and wasn't expecting much from your show. You proved me SOOOO wrong! 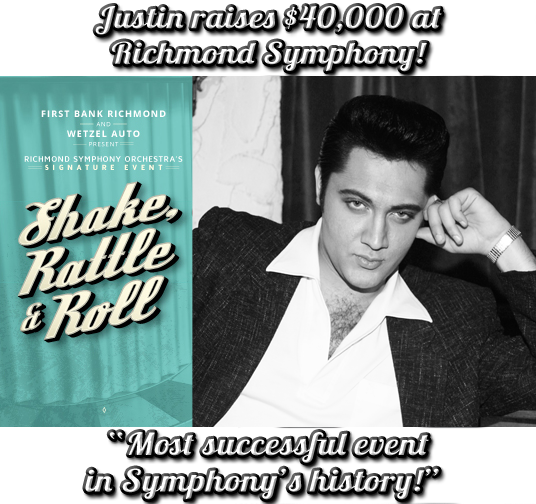 After seeing Elvis and then Justin, I now HAVE to believe in reincarnation!! WOW! Besides the obvious, his looks and moves, he has an incredible voice! I had the chills. And, the band was awesome! Came into the concert pessimistic but came out having had a wonderful, entertaining and glorious night! Come back soon!" "My husband and I saw Justin Shandor in Lewiston, Id. OMG. I had seen Elvis in concert 3 times and almost did not go to the show afraid of disappointment after all there is only 1 king. To my amazement Justin made memories seem like reality. His movements and characteristics were the same, he looked like him and my lord he sounded like him. As I glanced around the venue mouths were covered in shock, people gasped in awe and women cried as if it were the king on stage. The band was like listening and watching in the 60's and 70's. Thank You all for having the talent to bring to life a time so many of us remember and would not otherwise have a chance to relive. I will be at every show I have a chance to attend, my husband and I both left filled with emotion of joy, happiness, chills, sadness, and thankfulness, for this we thank you."